In this tutorial we will show you how to reset your WordPress Permalinks. 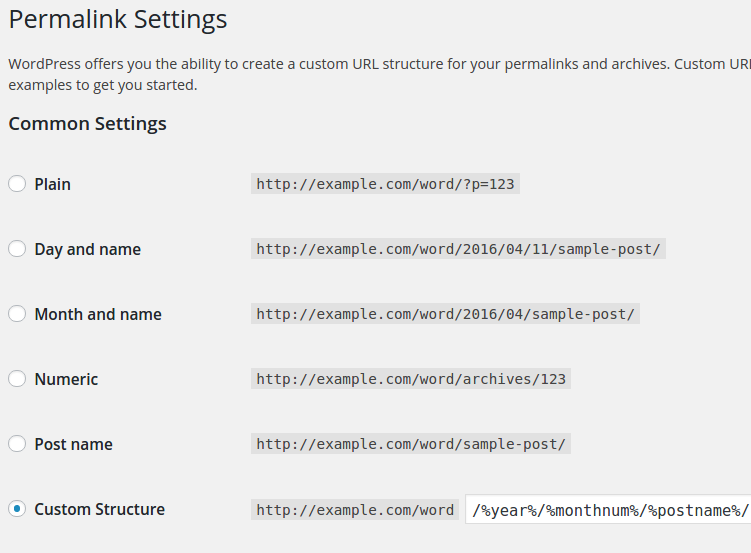 Resetting permalinks rebuilds your link structure for WordPress. Often, this process must be performed after migrating a WordPress website, or when troubleshooting 404 errrors. This is accompished by choosing a different permalinks setting, and saving it. Then putting the permalink setting back to the original setting and saving it again. This is a common step when Troubleshooting WordPress problems. What's the best way to speed up your WordPress sites? Use the optimized WordPress Hosting solutions that InMotion Hosting provides. In the navigation menu click Settings, then click Permalinks. 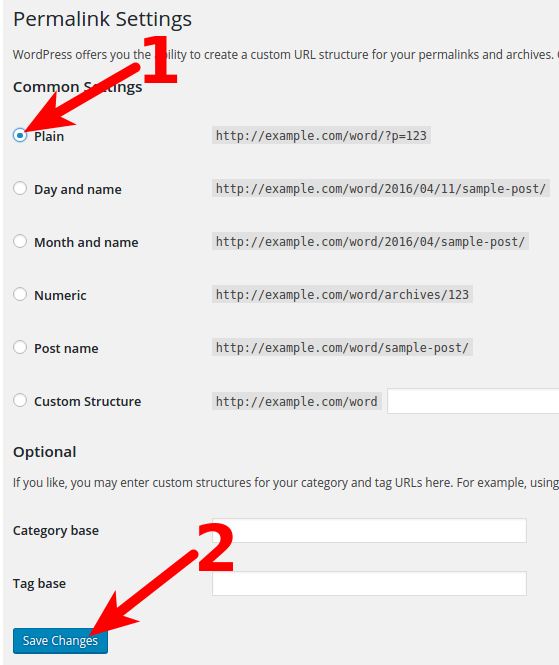 You will then be on the WordPress Permalinks Settings page. Notice what setting you have selected, options are Plain, Day and name, Month and name, Numeric, Post name, Custom Structure. If you are using a Custom Structure copy and save it, so you can put it back later. Select the Plain setting, then click the Save Changes button. If you already have the Plain setting selected, choose Day and name, then click the Save Changes button. You will then see a message stating Permalink structure updated. Now, select your original setting, and click the Save Changes button again. You are finished when you see the "Permalink structure updated" message again. Your site permalinks should now be working again. You may have to clear your browser cache before testing. Congratulations, now you know how to reset your WordPress Permalinks! 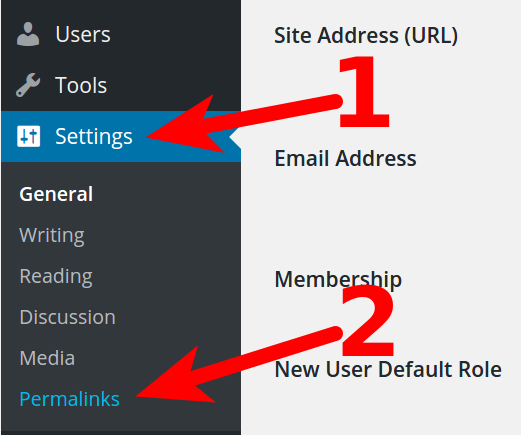 For more information see our guide on Setting Up Permalinks on your WordPress Site. I was driving myself crazy with this issue. I was helping someone using Wordpress.com the nectar theme. she never changed the permalinks from plain. but when we changed it from plain to post title, it broke all the menus. after changing the permalinks on the site - do I need to go re-create the menu - or is it something else. We mainly support the stand-alone wordpress.org sites (as opposed to WordPress.com), so the information we have may not apply. Typically, the menu will break if you are using links that were made from posts that were formatted one way and then changed. You will need to make sure you have settled on the permalink format and then reset all of the menu links using the new format. Ive not used wordpress in ages! I have severfal affilliate offers on my site and have double checked all their urls. The problem is, first I add the procuct pic into a post and a bit of an added taxt ad with "Click Here". Where I want the link to work. Ive highlighted the "Click Here" with the link tool, and did in fact get the link into the text box. Then I publish my page and open my main site, and the links are Dead! Clicking on the "Click Here" link, just wont take my web visitors over to the offer page. I looked thru all the Wordpress tutorial videos, checked for more tutorials on Youtube, nothing works! Would changing my Permalink settings fix the problem? I really need to make some money online. Im about broke, and now wordpress is a problem! Im ready to flush wordpress for something better. Thanks for all replies. Sorry for all the problems you're having with the WordPress links. WordPress does not make changes to inks that you add in your WordPress site - that is not part of its functionality. If you have made a change to the URL in the link then you may want to review the URL to make sure that it is working properly on the internet. We would need more information about the link(s) you're trying to use in order to troubleshoot the issue. The change in permalinks would be needed if you've moved your WordPress site to a different location or if you have change the URL in some manner.